Positron emission tomography (PET) is a non-invasive method for in-vivo imaging of living tissue, which allows tracking of metabolism of biomolecules, marked with a radioactive isotope. The activity distribution in tissue is determined by detecting colinear pairs of the annihilation gamma rays with position sensitive detectors surrounding the patient. By detecting a large number of gamma ray pairs in such a way, an image representing the source distribution can be reconstructed. If the time difference between the arrivals of the two gamma rays can be measured precisely enough, the obtained time-of-flight (TOF) information can be used to significantly improve the reconstructed images. Reconstructed image of a phantom source in a simulated TOF PET scanner with excellent time resolution. The time resolution in TOF-PET measurements is mainly limited by the time response of the photodetector and the time constants characteristic for the production of scintillation light. The limitation due to the scintillation process can be avoided by using Cherenkov light instead. This is produced promptly by a passage of fast charged particle (e.g. an electron, resulting from annihilation gamma interactions with matter) trough a suitable material. Lead fluoride (PbF2) was identified as the best available Cherenkov radiator material. It has better gamma stopping power than the scintillation crystals mostly used in PET, has excellent optical transmission down to 250 nm, and is also scintillation free. 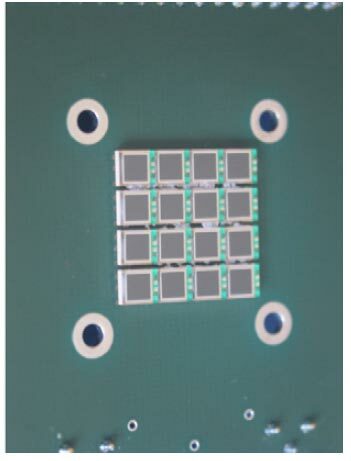 First experiments were performed using monolithic PbF2 crystals coupled to very fast photodetectors, the microchannel plate photomultipliers (MCP PMTs). In a simple back-to-back detector arrangement, an excellent TOF resolution of 87 ps FWHM was achieved using 15 mm thick PbF2 crystals. The experimental setup using MCP PMTs and 25x25x15 mm3 PbF2 crystals. Visible in the middle is the 22Na annihilation gamma source. 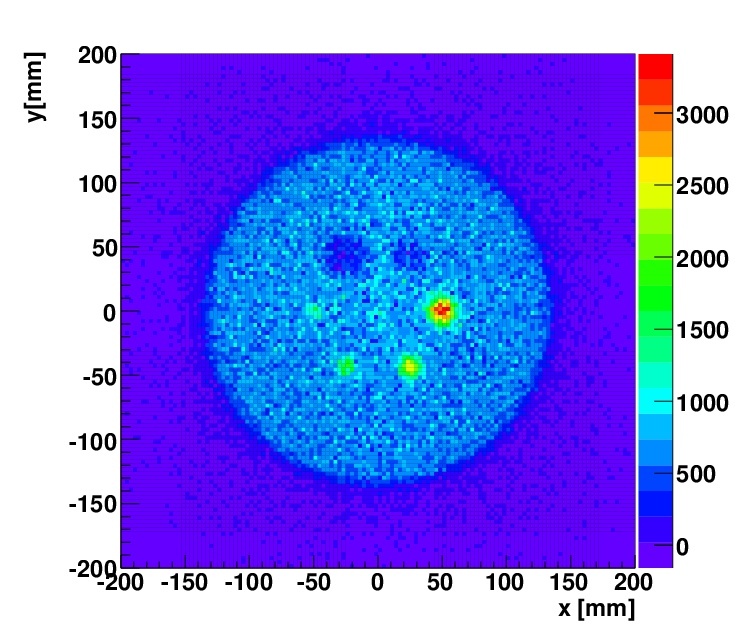 The coincidence time distribution obtained using MCP PMT photodetectors. A time resolution of 87 ps FWHM was measured with 15 mm thick PbF2 crystals. However, the detectors used had a relatively low detection efficiency, mainly due to the limited photon detection efficiency (PDE) of the MCP PMTs used. 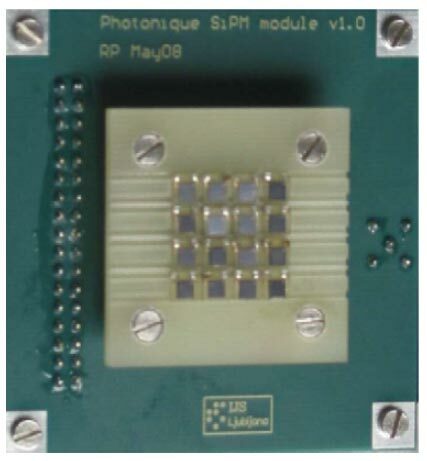 The detection efficiency was significantly improved when silicon photomultipliers (SiPMs) were used as the photodetector. 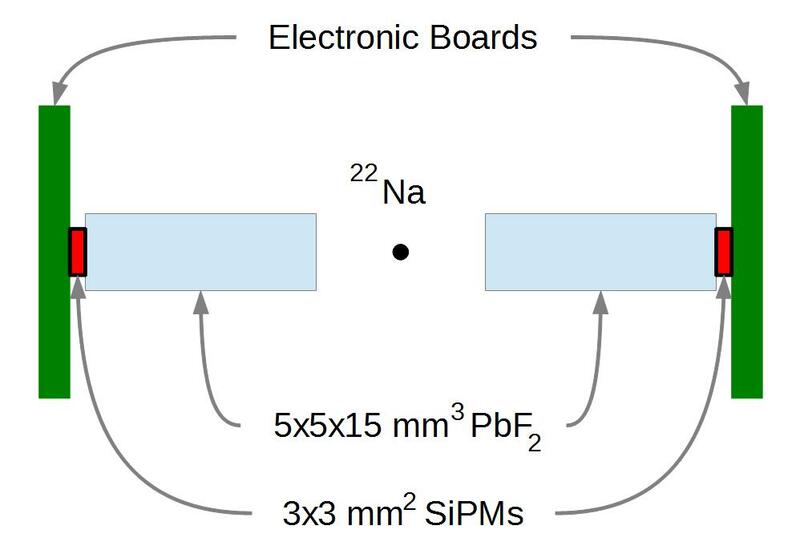 Using 3x3 mm2 active area SiPMs coupled to 5x5x15 mm3 PbF2 crystals, a single side efficiency of 14% was measured with bare crystals and at high SiPM overvoltage. Extrapolated to 1:1 SiPM-crystal surface coupling, this infers that a 40% single side efficiency is possible. The SiPM have other beneficial properties, such as relatively low cost and immunity to high magnetic fields, but they have a slightly limited time response and high dark count rate. With the SiPM samples tested, a TOF resolution of about 200 ps FWHM was measured in the best case. It has also been demonstrated, that SiPM dark counts can be significantly reduced by cooling. Overall, using exclusively the Cherenkov light, TOF-PET time resolution below 100 ps FWHM can be achieved. Using photodetectors with sufficiently high PDE, detection efficiency that is on the same level as that of traditional, scintillation TOF-PET can be reached. Additionally, a Cherenkov based PET scanner could be produced at a lower cost since PbF2 is significantly less expensive than scintillation materials currently used in PET. A diagram of the experimental setup used for measurements with SiPM photodetectors. R. Dolenec et al., Efficiency of a Cherenkov based PET module with an array of SiPMs, Submitted to the proceedings of the RICH 2018 conference (2018). The majority of PET devices use PMTs, but due to their size, relatively poor ratio of active to total surface and high price, which is a significant fraction of the total cost of the device, it is worthwhile to search for alternative detectors of visible and infrared photons. The sensitivity of PMTs to magnetic fields and the increasing requirement to unify different image modalities in one measurement, provides an additional reason to search for new detectors. One would like to incorporate a PET apparatus inside a MRI magnet for simultaneous imaging of tissue function and density. A new type of semiconductor detector, the Silicon Photomultiplier (SiPM) looks very promising. Two 4x4 arrays of Photonique 2.2x2.2 mm2 and Hamamatsu 3x3 mm2 active area SiPMs were constructed. The arrays had a pitch of 4.5 mm and were coupled to a matching array of 4.3x4.3 mm2 LYSO scintillation crystals. Energy resolutions of 21% and 10% were measured using Photonique and Hamamatsu SiPM array respectively. 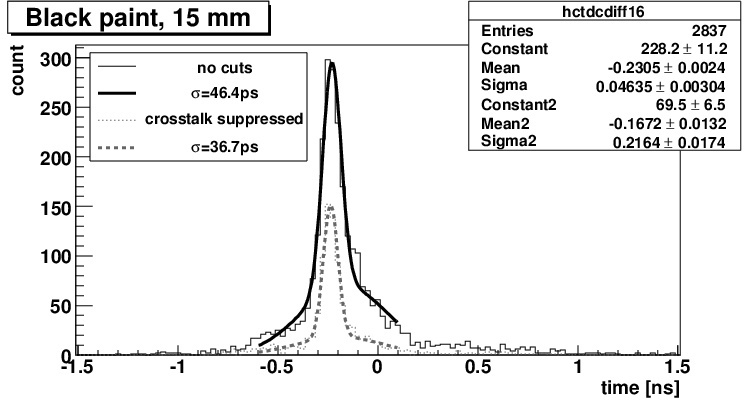 Using Hamamtsu 3x3 mm2 SiPMs, a coincidence timing resolution of sigma = 442 ps was measured. The fine granulation of SiPM modules also enables depth of interaction (DOI) decoding. By coupling a LYSO crystal, which is non uniformly segmented in the Z direction, to a 4x4 array of SiPMs, a DOI resolution of 1.6 mm could be achieved. The 4x4 arrays of Photonique (left) and Hamamatsu (right) SiPMs.